Hunters, Cowboys, Quigley shooters, and Sharps enthusiasts, your kit is not complete without a high quality cartridge belt. Whether taking a stand on a buffalo, harvesting a whitetail, or going to a rifle match, you'll need a good belt to hold your ammo. This belt is not just good it’s great. Exhibiting the finest in leather and canvas workmanship, Quigley Champion Wes Daems of 7X Leather creates what’s arguably the finest cartridge belts made. Demand for Wes’ high quality work is very high so please allow 5-6 weeks for delivery. Colors available are canvas or Brown and may vary from picture shown. Also, note your waist size. 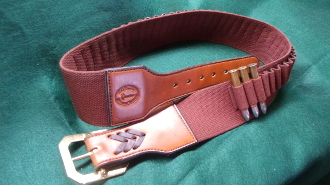 You will be very pleased with the quality and period look of this belt. THIS BELT CAN ONLY BE PURCHASED HERE. Don’t be seen at the match without it. Made in the USA.